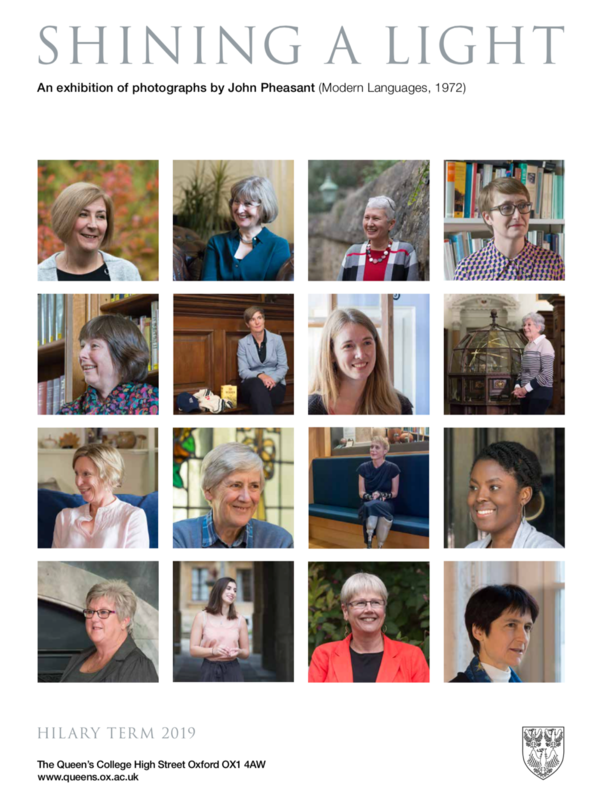 A set of photographic portraits has been commissioned for a temporary exhibition in the cloisters in celebration of 40 years since the admission of women by the College. 2019 marks the 40th anniversary of the admission of women by the College. This exhibition celebrates this milestone by featuring women who have contributed to the College over the past four decades. It includes current and former academics, staff, Old Members, and current students, each with a one-word description chosen by the subject. Every individual included has been nominated by others to appear in the exhibition. In 2018 John Pheasant, an Old Member of the College, made the exhibition possible by offering to take a series of photographs of College members from the past four decades. A modern linguist at Queen’s (1972 - 76), John first pursued a career in European Community law while developing his interest in photography. He turned semi-professional a few years ago. Recent exhibitions in London include Challenging Perspectives at the Nehru Centre and A Tale of Two Southwarks at Roast in Borough Market, both with Indian oil painter Suchi Chidambaram.